La Mer's luxury skin care line includes several products, including The Regenerating Serum, which is designed to bring your skin back to its youthful appearance. It's meant to be used in conjunction with other La Mer products, but I incorporated it into my regular skin care routine to really test its effects on its own. Even alone, it turned this anti-aging product skeptic into a believer--and it took less than two weeks for results to show up. The Regenerating Serum from La Mer is part of the Face Treatments line and contains La Mer's proprietary Miracle Broth™, as well as the new Regenerating Ferment™, derived from marine plant stem cells (from Eryngium Maritimum). The idea is that wrinkles and lines are "micro-scars" that are a result of stress-both internal and external-including UV rays and free radicals. Based on these observations and after four years and hundreds of hours of work, the Max Huber Research Labs created The Regenerating Serum. The serum is designed to rev up the production of collagen, elastin, and other "youth proteins" in the skin after the skin has been damaged by those internal and external stressors. It works for all skin types. It was created to rejuvenate and renew the skin, practically turning the clock backwards by smoothing away those fine lines, visible pores, and wrinkles. Miracle Broth™: The stepping stone for The Regenerating Serum, this was created by Dr. Max Huber and is known for its healing energies. The Regenerating Ferment™: This is a bio-ferment that contains the marine plant stem cells. Its role in the serum is to assist in the skin's renewal, support its natural structure, and keep it protected from external stressors. The Marine Peptide Ferment: This ingredient in the serum firms the skin and boosts collagen production. Colloidal Gold: This acts as a conductor, ensuring that the benefits (smoothing, firming, and resisting irritation) make it into the skin. Lime Tea: An antioxidant and lime peel extraction that was one of the original ingredients in Crème de la Mer. My skin is dry and sensitive, with a few fine lines around the eyes and along the forehead. My pores became visible after a long cycle of eczema and acne a few years ago, and my regular routine--even with amped up exfoliation--had done very little to shrink them back down once my skin had calmed down. On some days, my skin has a flushed appearance. I applied The Regenerating Serum to my face and neck twice a day. I used my normal cleanser and then applied the serum. I waited about two minutes for the serum to sink into my skin and then I applied my moisturizer with sunscreen or my regular night cream. I pumped a few drops onto my fingertips, transferred a little to the fingertips on my other hand, and then lightly touched my face to dot the product on before I began to rub it in. The serum seems heavier than it actually is when you first apply it. It isn't runny like an oil or many other serums. However, once you begin to spread it over your face and neck, you realize just how lightweight it actually is. My skin is dry and soaked up the product almost instantly, but I don't think even oily skin will feel as if there's a film there. It's like wearing nothing at all. Because it's so lightweight, it is not a moisturizing product (nor does it claim to be, as it's a treatment and not a part of The Moisture Collection), so you'll want to follow up with a moisturizer. It does feel silky, almost like an extremely lightweight primer, but it's much thinner and sinks into the skin effortlessly. 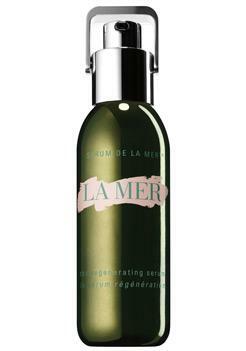 La Mer recommends using it with Crème de la Mer, day and night. Even though my skin is incredibly sensitive, I had no problems with applying the serum twice a day. In fact, I think my skin tone has evened out a bit and I've experienced very little redness since I started using it. I was able to test The Regenerating Serum from La Mer for two weeks. In that time, I saw a marked change in the visibility of my pores, and the lines around my eyes are almost non-existent now. The deep crease in my forehead is less noticeable. I will admit that for a few days, I was skeptical, but then one night a server in a restaurant asked if my daughter was actually mine during a family dinner. She seemed shocked that it was possible and kept saying how good I looked. At that point, I decided that the glow I thought I'd noticed in my skin was real-not something I imagined because I was trying out a new product. I hadn't changed my makeup or any other part of my skin care routine. I hadn't been sneaking in extra hours of sleep or drinking extra water. It had to be The Regenerating Serum, and this was only about one week into the trial. The Regenerating Serum claims to make immediate changes in the skin. I will say that I thought my skin looked fresher after I put it on, but I couldn't pinpoint the changes after the first use. Still, comments after one week prove that this product acts faster than most serums, which can take up to eight weeks to show improvements in the skin, if at all. Personally, I like to know a product is going to work well before eight weeks' time, if I'm investing time and money into it. That said, I look forward to seeing how The Regenerating Serum continues to change my skin in the future. Crème de la Mer, the product that started it all. It was created by Max Huber, an aerospace physicist who wanted to create a cream that would heal the scars he'd gotten as a result of an accident in the lab. Based on an interest in sea kelp's regenerative properties and the energies of light and sound, he set out to explore bio-fermentation. Twelve years and 6000 experiments later, he had the perfect combination in his Miracle Broth™ and Crème de la Mer. The Eye Concentrate is designed to eliminate wrinkles, fine lines, dark circles around the eyes. It also helps puffiness. Use it morning and night. The Cleansing Fluid dissolves all the makeup and impurities left over from a long day. The SPF 30 UV Protecting Fluid can be used on top of your daily moisturizer (like Crème de la Mer) to protect your skin from UV damage. SPF is important in any skin care routine. The Tonic is to be used after cleansing (and before The Regenerating Serum), and revitalizes the skin. Would I recommend the product? Yes, for any skin type. Just be sure that you have a moisturizer that is appropriate for your skin type to follow up with, especially if your skin is dry. The serum did not dry out my skin, but I did feel a definite need for moisturizer after I applied it. I couldn't have put my makeup on right on top of it, for example. The results are obvious and other people have commented on the change, so I can't wait to see how flawless my skin can get with more use. The Regenerating Serum was provided for free to review.